Jobsoid helps in simplifying your preliminary candidate screening process with video interviews. 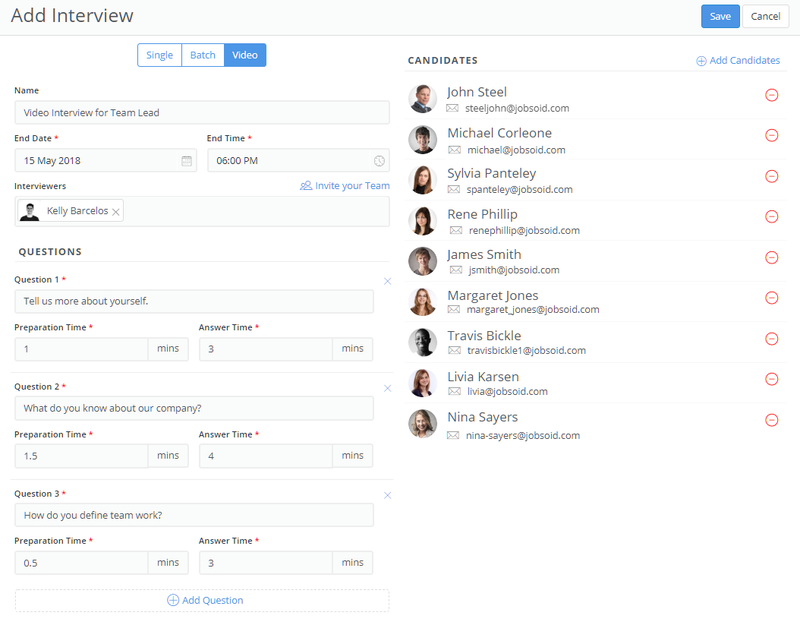 Candidates can answer interviews at their convenience while you view them at yours. Video interviews can be scheduled in a few easy steps. Once you schedule the interview, you will be directed to the interview details page. Click on Email Invite button on the top-right corner of the page to send out video interview invites to your candidates. Jobsoid allows you to add candidates to your scheduled video interview at any point in time, before the end date of the interview. Candidates will be required to download Jobsoid Video App to answer the interview. Once completed, you can view the candidate responses in the Video tab on the Interview Details page. All the responses are presented in the form of a playlist with pause and play controls. You can view them at your convenient time and place.